Denny Johnson is originally from small town Ohio and started WIT classes in 2013. In addition to WIT House ensemble Commonwealth, Denny is in WIT production Going to the Movies Alone – 2015’s Fighting Improv Smackdown Tournament winners. Denny does not believe in a higher power, but does believe that Star Trek is destined to happen. 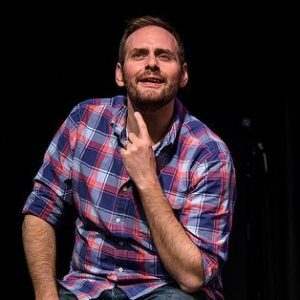 He owes everything to his husband Chad, who can often be heard saying, “oh, you’re doing one of your improv skits.” When not on stage, Denny reports to work as a federal employee, which is its own form of character work.